TechCrunch posted a link to another tool to keep up with the flood of election-related news coming from news services and each of the presidential campaigns. 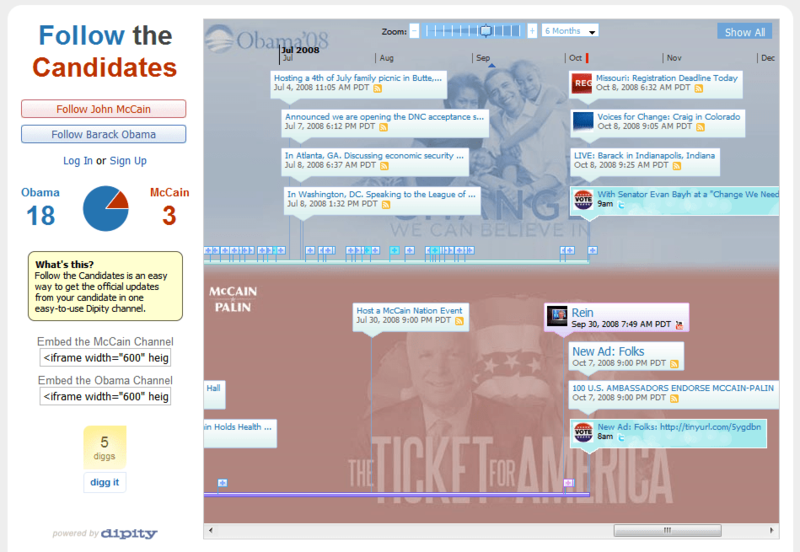 Dipity Election Center presents news items in a time-line format. The interface is very cluttered and not exactly intuitive (e.g., unclear what all the little icons below the timeline mean), but an interesting way to present news for news junkies like me. It presents less at-a-glance information than the website everymomentnow. How do you keep up with election news? (if you do at all). I see now that the plus icons are to zoom in to expose more information. What do the pie charts mean? The number of people “following” a candidate on the site? The number of news articles on each at the moment?